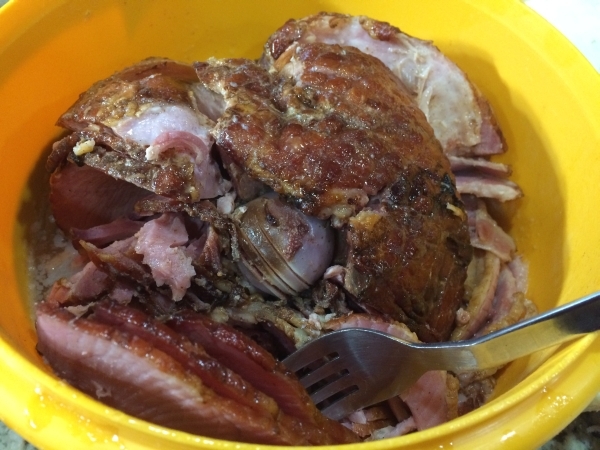 Years ago, I enjoyed some little individually wrapped ham sandwiches that a friend brought to a weekend gathering. Her’s were gooey and the flavors outstanding! 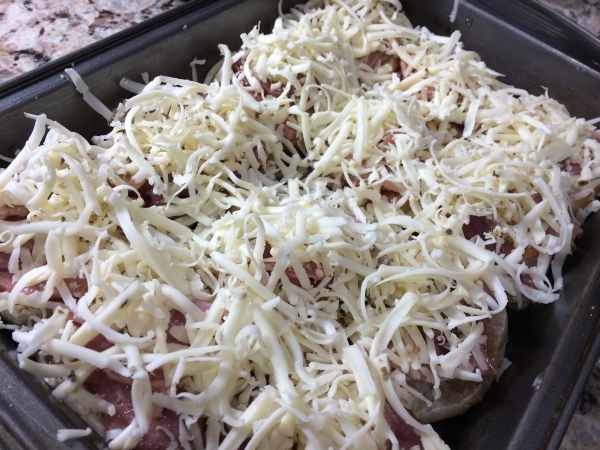 This is my version based on my recollection of what was in them; utilizing ingredients that I had on hand in my fridge and pantry. 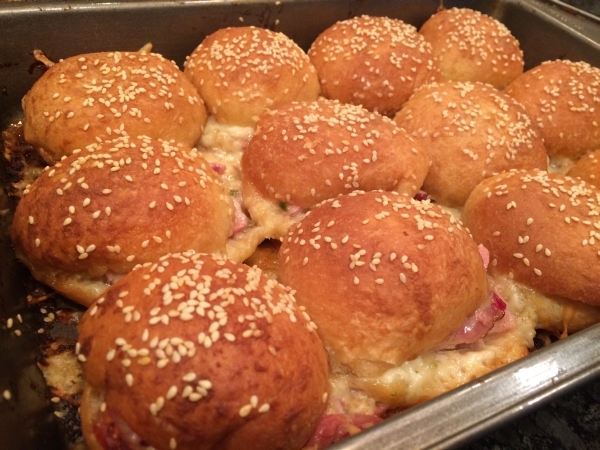 These little Mini sandwiches prepared with freshly baked dinner rolls, stuffed with sweet ham and melted cheese are savory from the rich mustard sauce making an easy, tasty little bite or appetizer. I had some ham left over from Easter dinner and always have the Rhodes dinner rolls on hand in the freezer and with a few more ingredients, I was able to come up with a great appetizer for a recent girls night. 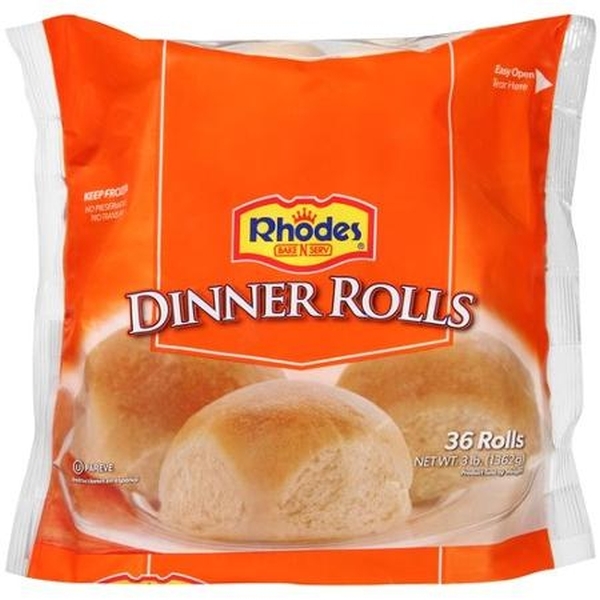 I prepared the dinner rolls according to package directions. 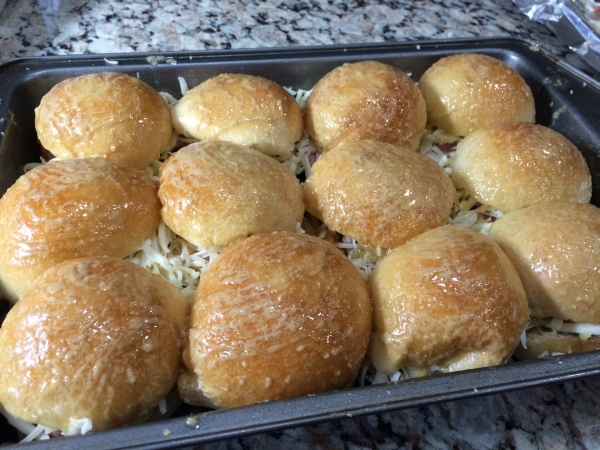 When ready to prepare the sandwiches, preheat oven to 350 degrees. 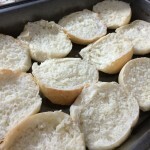 Using serrated knife, slice the buns in half. 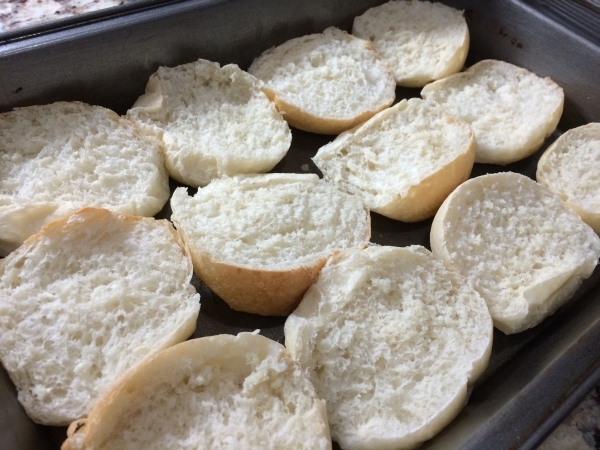 Spray a 9×13-inch baking pan and line the bottom with the bottoms of the rolls; touching. 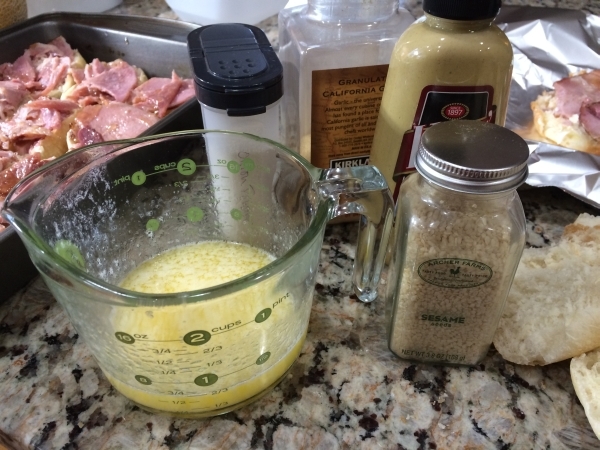 In a bowl, mix together butter, Dijon mustard, Worcestershire sauce, garlic, and dried onion powder. 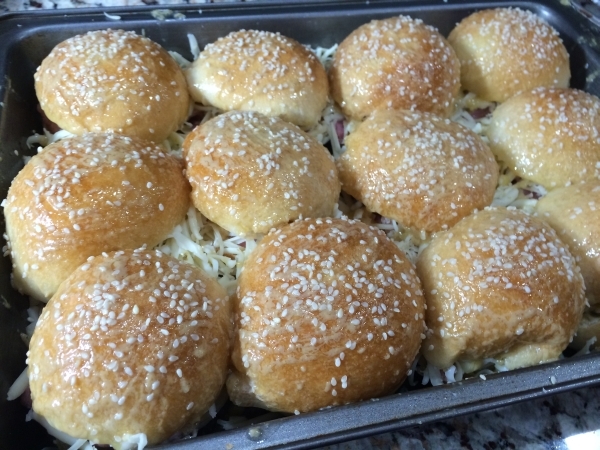 If using, spread tops and bottoms of buns with a thin layer of horseradish mayonnaise and then layer ham onto each of the rolls. 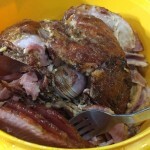 Top with the shredded cheese to cover the ham. 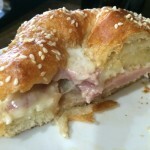 I like a mild, creamy horseradish mayo/sauce, but you can use regular mayonnaise or skip it all together. 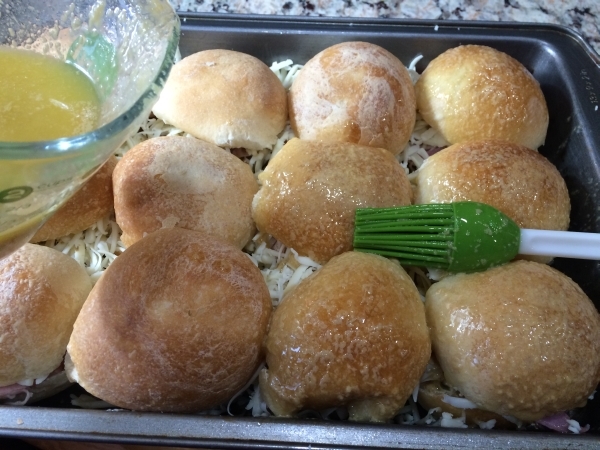 Place the tops of the rolls onto the sandwiches and brush the butter mixture evenly over the rolls. 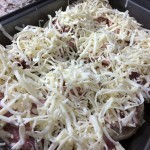 Sprinkle with sesame seeds and cover with foil. 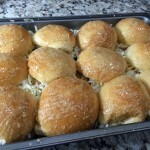 Bake in the preheated oven until the rolls are lightly browned and the cheese has melted, about 20 minutes. 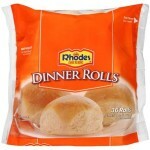 Remove foil and bake an additional five to ten minutes. 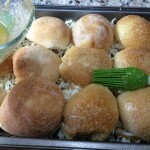 The buns should be caramelized on the bottom and golden brown on top. 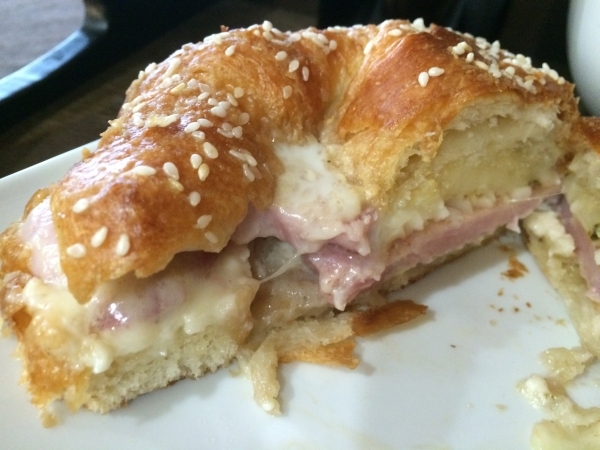 I’ve also made these with croissants and Kings Hawaiian sweet rolls. 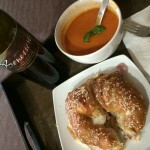 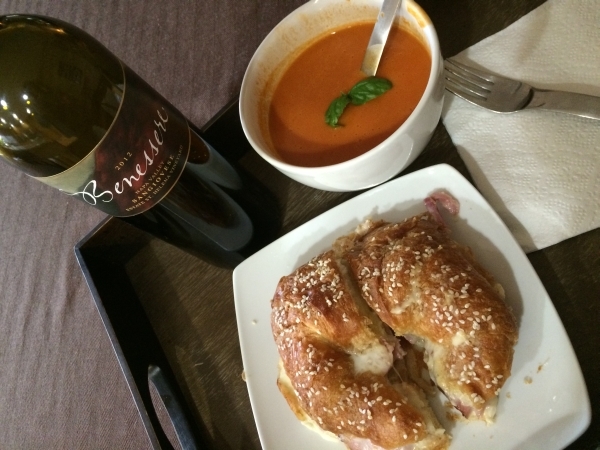 Bill enjoyed his along side a cup of tomato basil soup and paired with a wonderful 2012 Sangiovese by Benessere Winery!